November 28, we welcomed Daniella Sofia into the world. She is the younger sister of Ana Lucia. Anilu has quickly taken on the role of ‘big sister’ with joy and delight. In the picture, you see her feeding her new baby sister. I’m sure Ani feels very grown up and capable, but if you look closely there is a very large hand under the baby. Ani is doing her thing, but dad (Zach) is supplying the strength and security the baby needs. Isn’t this a picture of life? We act very capable and determined to do our thing. We make plans, buy supplies, plan calendars, and set everything in order for an occasion. However, we sometimes need to be reminded that underneath the order of our days, there is a divine Order supporting us. Zach would never take his hand away and leave Ani holding the baby. She is not capable on her own of providing all that is needed. She may not want help. She may not even realize help is there. But for this scene to remain one of bliss, dad’s hand must remain a part of the equation. Reflect with me: Where is God’s hand under my life? Is there any area where I am acting like I don’t need him or want him? Have I ever thought about what my life would be like without his hand under me? He not only is able; he wants to hold us. Even when life is hard, it is good to remember we are in good hands. These pictures contain an illustration of one of the reasons I believe there is a God who created the heavens and the earth. 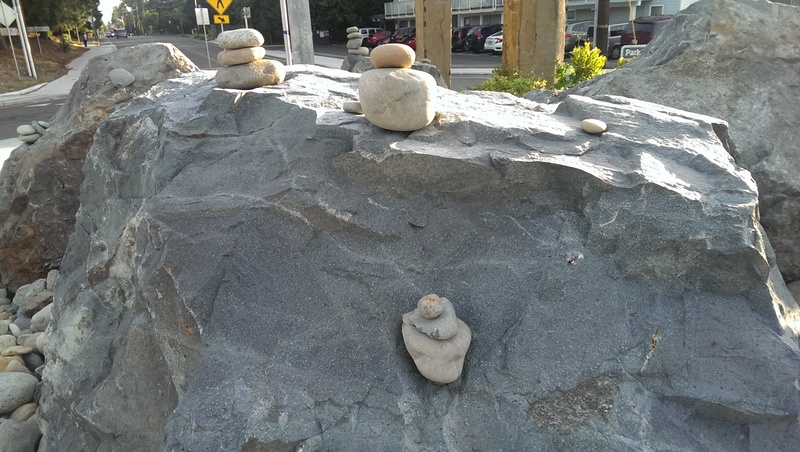 I saw these mini rock piles stacked in a roundabout near my home. They were not there not there one day and the next, several cleverly located stacks decorated the center circle. 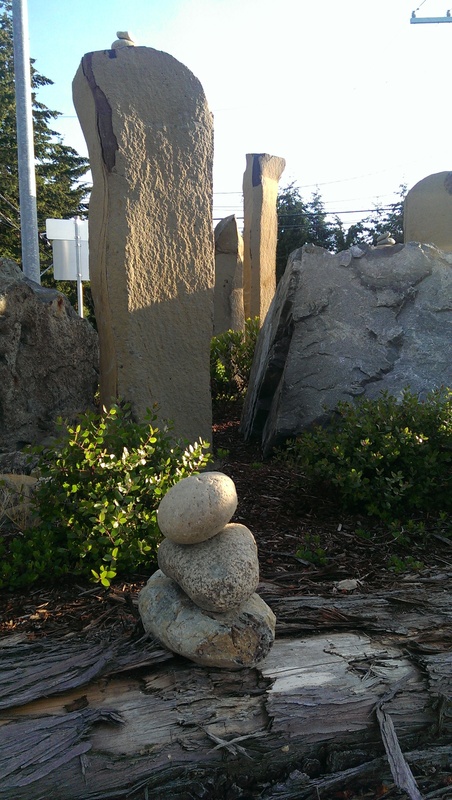 How do rock piles point to God? I am convinced those rocks did not get there by themselves. I believe someone put them there. They didn’t materialize overnight and form this array of attention grabbing details without someone helping them. I don’t believe they stacked themselves, or that they grew out of surrounding rocks, or were carved over time to make this engaging display. Someone wanted to display their artistic idea and these rocks became their media. When I look at the creation that surrounds me, it is too complex to evolve or mystically appear without some Designer behind it. Even the most intricate explanation I have heard pertaining to the origins of the earth do not challenge my conviction that ‘In the beginning, God made the heavens and the earth.” For me, that is not incompatible with science. God did his creative ‘overnight’ demonstration a long time ago. 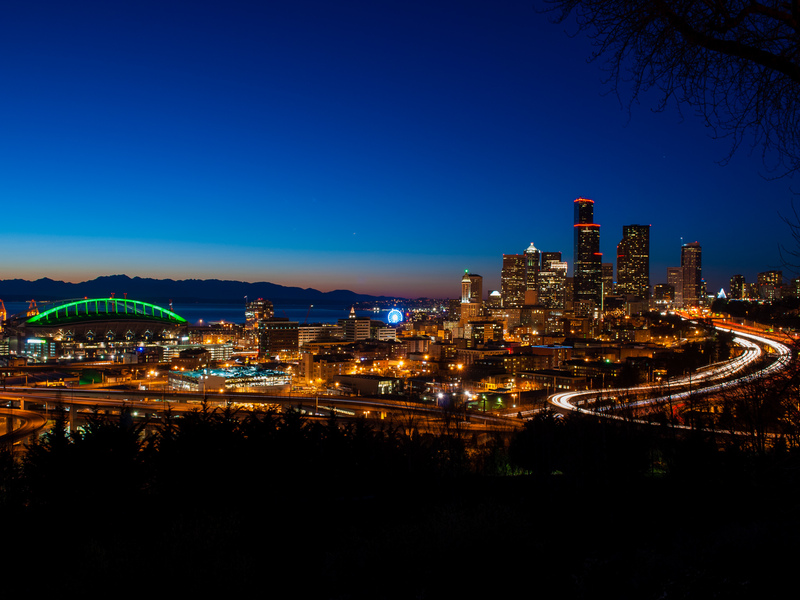 The earth we see today has changed from that first morning. But the earth we see today still points me back to the One who made it. Whether you live on an ice cap, a parched desert, a drenched rain forest, or a spectacular mountain side, you can choose to spend your energy explaining away or embracing the Creator. For now, I can be rather delighted in this human made reminder that Someone helped me get to where I am. I’ll choose the embrace and give thanks to the One who made me and the anonymous rock artist who gave me this image. How many ‘artistic expressions’ do you see? 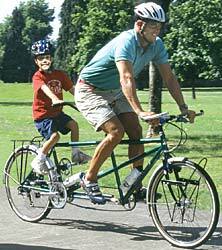 On the way to the office, I saw a father and daughter riding a tandem bike. The little girl could not have been more than second grade. None the less, she was peddling with her dad on their way to school. I looked at this and wondered to myself, what would happen if dad quit peddling? I can’t imagine it would have been long before the bike would have slowed to an untenable speed and fallen over. The little girl did contribute to the forward movement, but she did not have the strength to propel it forward without some help. This is a great image for us of following Jesus. We are not along for a free ride with no effort. We are not placed in charge of the bike and expected to provide all the power. We are invited to climb on and join Jesus in the journey. Who is providing power for your ‘discipleship bike’? Who is the man in the mirror? That is our beloved Marcel Eisma in a unique self portrait. Marcel has been providing thought provoking images for our worship services and our blog for the past two years. This month, we say goodbye to Marcel and Jill. They are moving to a new home in a different state. We would love to draft him, but he said the pictures would not have a local feel! We want to thank Marcel for his generous donation of time and talent. Also, for his provocative notes where he has opened up and shared a part of his journey with Jesus and has challenged us to reflect on ours. 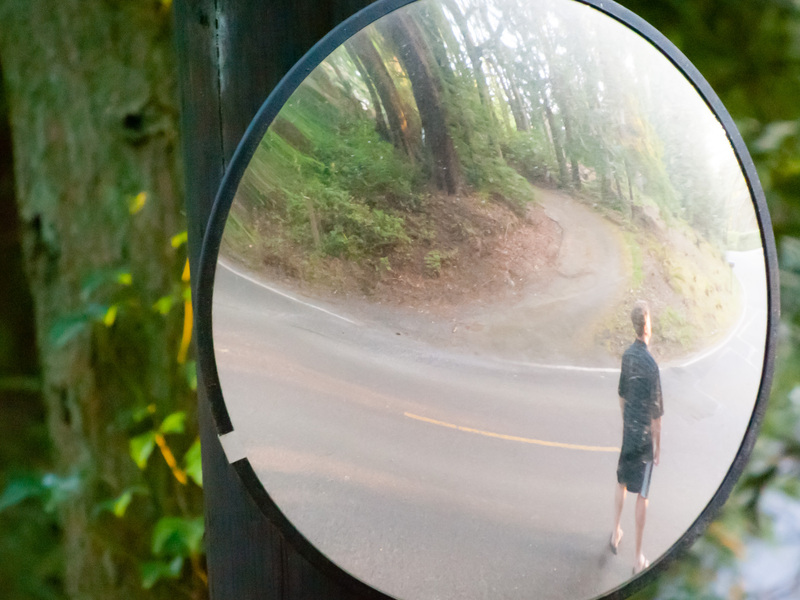 He has blessed us with an avenue of reflection we call visio divina – seeing God in the things around us. Here is wishing you the very best on the journey and thanking you for enriching ours. Jesus taught us that we are not human beings with a spiritual experience, but we are spiritual beings with a human experience. Our life on earth is just that; when He calls us home, our spiritual life has merely begun. The book of Revelations offers us a glimpse of what’s around the corner, just like a traffic mirror. But what we see is distorted by our own fears and preconceptions, and also because words simply cannot describe God’s reality. It’s like explaining a typewriter to a goldfish. At the end of time, none of this matters. It is not what we’ve done, how we’ve done it, or how successful we have been that means anything. The only thing that matters is that we accept God’s grace through our faith in the Father, the Son, and the Holy Ghost. Each of us is the prodigal son, returning home. The race I have found myself running for more than 40 years of my life consisted of praise, pride, and pretense. I would let no opportunity go by to praise myself and the wonderful things that I had done. And in more than one way was I proud of my accomplishments: proud of what I had done, but also boastful and arrogant. And I continued to pretend that it all had meaning, and that there was not a gaping hole in my soul that all the accolades still could not fill. How things changed when I realized that it was not by my own merit that I was able to create something, and that I did not have to do anything to earn the acceptance or love of my Heavenly Father. I now do things because God has blessed me with the talents and opportunity to do what He needs me to do. The value of my works is no longer being measured by how “successful” it looks, but by how God’s grace is working through me. I cannot create anything that does not come from God. I no longer haveto do things to be blessed; I get to do things because I am blessed.